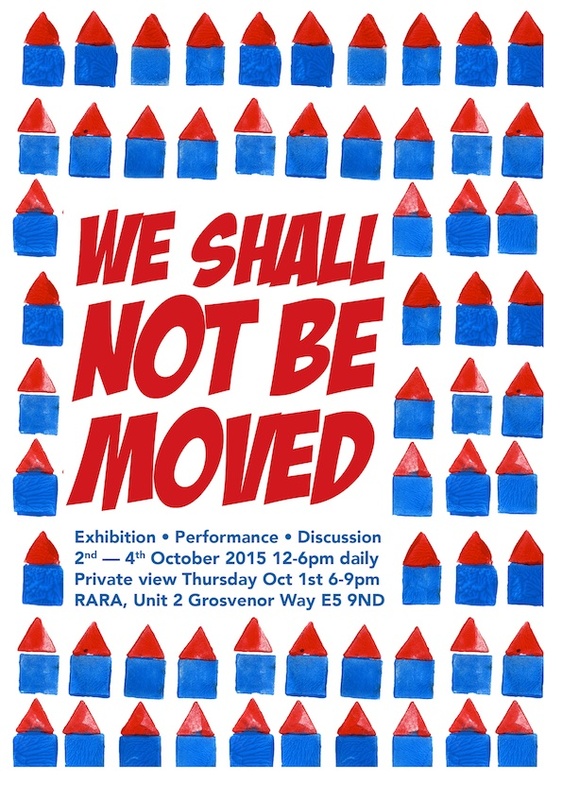 As part of the Art Licks Weekend, RARA presents “We shall not be moved”, an exhibition bringing together artists, activists and architects to explore the idea of “home” in this city at this time as the housing crisis intensifies. Learn how to fly-post with Digs, Hackney renters, exchange your tales of letting agents for plant dibbers that Lindsay Draws turns on the lathe from posts that once held estate agent signs, enjoy a “home” cooked meal with RARA members while discussing ways in which artists and architects can challenge the idea of properties for profit over people, learn the story of a Victorian house from construction to present day while watching Urban Histories, a new performance conceived by Sarah Akigbogun, performed with Nadine Ivy Barr, nd consider what it takes to create home wherever you are with whatever you have with Alexandra Parry and Eva Freeman. 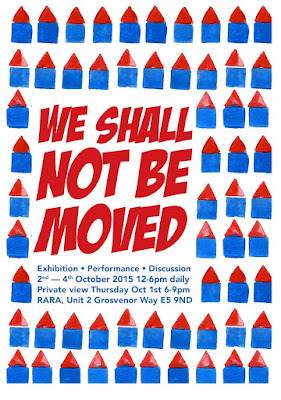 We Shall Not Moved is a collection of art works, activities and performances to engage audiences whatever their personal housing situation. Friday Evening: Fly-posting workshop with Digs Hackney Renters 7-9pm Learn creative ways to publicly express your discontent with developers, letting agents and other forces of gentrification. Bring a brush all other materials provided. Saturday Day: Exhibition open 12-6pm Performance and live wood turning throughout the day. 2pm Performance by Eva Freeman exploring her experiences of creating home for her and her son. 2.30pm Talk by Andrew Marsh 'dream homes' about futuristic/absurd/fictional visions of housing, with the underlying theme being that dreaming and sharing amazing things is an important counterpoint to the mundanity of struggling against capital. Swords into Plowshares, live wood turning throughout the day. Bring your best story about being messed around by an estate agent and trade it for a handcrafted dibber made from a post that once held an estate agent sign. Saturday Evening: 6pm Urban Histories, a new performance by Sarah Akigbogun. Learn the story of an East London Victorian house from construction to present day. 7pm An open discussion thinking about the different ways artists and architects can use their practices to challenge the current housing system that is failing so many people, hosted by RARA Co-op over a “home” cooked meal. BYOB. Swords into Plowshares: live wood turning throughout the day. See above.